The kitesurfing beach and its sandy lagoons in Paje are of world class quality with consistent warm winds and tropical waters. The water temperature in Zanzibar never drops under 24 degrees and, often in summer, can reach up to 30 degrees inside the lagoon. The kitesurfing spot in Paje is ideal for beginners and offers a perfect training ground for kitesurfers of all levels. During low tide you will find great flat-water lagoons. Over mid and high tide wave spots out on the reef can be reached kitesurfing and amazing downwinders planned. If you are practicing kitesurfing on your own and are booked with our centre for beach assistance and gear storage, we will be able to give you an introduction to the kitesurfing spot in Paje and show you the do's and dont's. 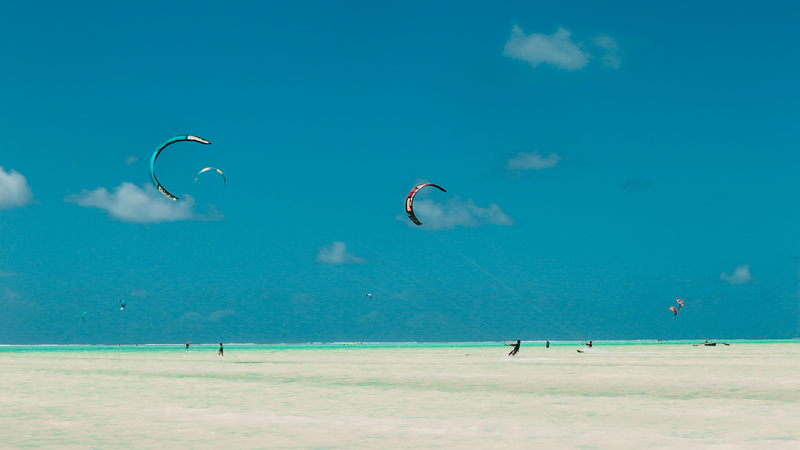 The huge tides in Paje on the East Coast of Zanzibar affect the kitesurfing spots and kitesurfing conditions. During low tide you get best teaching and learning conditions with shallow flat-water lagoons. Pushing and high tides are better for downwinders and more advanced riders, as well as wave kitesurfing on the outer reefs of Paje.